Nucleic acids continue to gain importance as novel diagnostic and therapeutic agents. 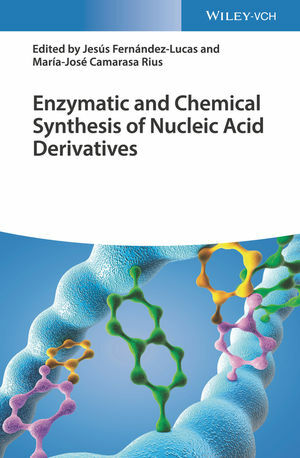 With contributions from noted scientists and scholars, Enzymatic and Chemical Synthesis of Nucleic Acid Derivatives is a practical reference that includes a wide range of approaches for the synthesis of designer nucleic acids and their derivatives. -Addresses the growing market for nucleotide-derived pharmaceuticals used as anti-infectives and chemotherapeutic agents, as well as fungicides and other agrochemicals. Written for biochemists, medicinal chemists, natural products chemists, organic chemists, and biotechnologists, Enzymatic and Chemical Synthesis of Nucleic Acid Derivatives is a practice-oriented guide that reviews innovative methods for the enzymatic as well as non-enzymatic synthesis of nucleic acid species. Jesús Fernández-Lucas, PhD, is a tenured professor at the European University of Madrid, where he leads the Applied Biotechnology research group. His research is focused on the design and application of novel biocatalysts for the enzymatic synthesis of nucleosides. María José Camarasa Rius, PhD, is Full Professor at the Medicinal Chemistry Institute of the Spanish National Research Council (IQM-CSIC) in Madrid, working on the design of novel enzymatic inhibitors with potential anticancer, antifungal and antiviral activity.